Another fabulous dinner thanks to the wonderful folks at SirenSeaSA (thanks Anna!) and their amazing seafood subscription service. 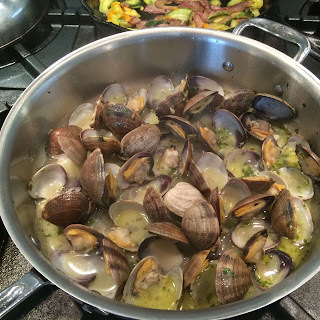 This week we got clams from and decided to go all old-school Italian on those delicious little shells with a recipe from a fantastic book, The Country Cooking of Italy, I picked up last year at Powell's Books in Portland. 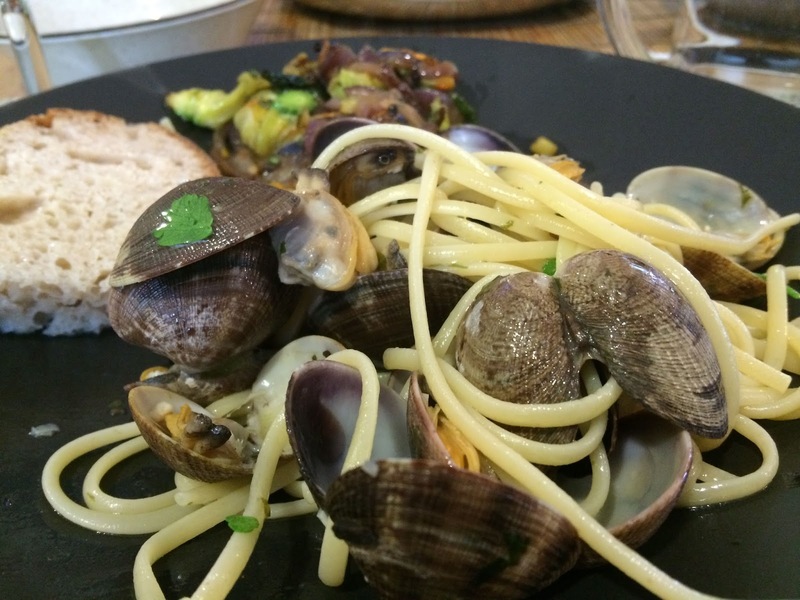 The recipe in the book only includes the clams, we added the pasta. 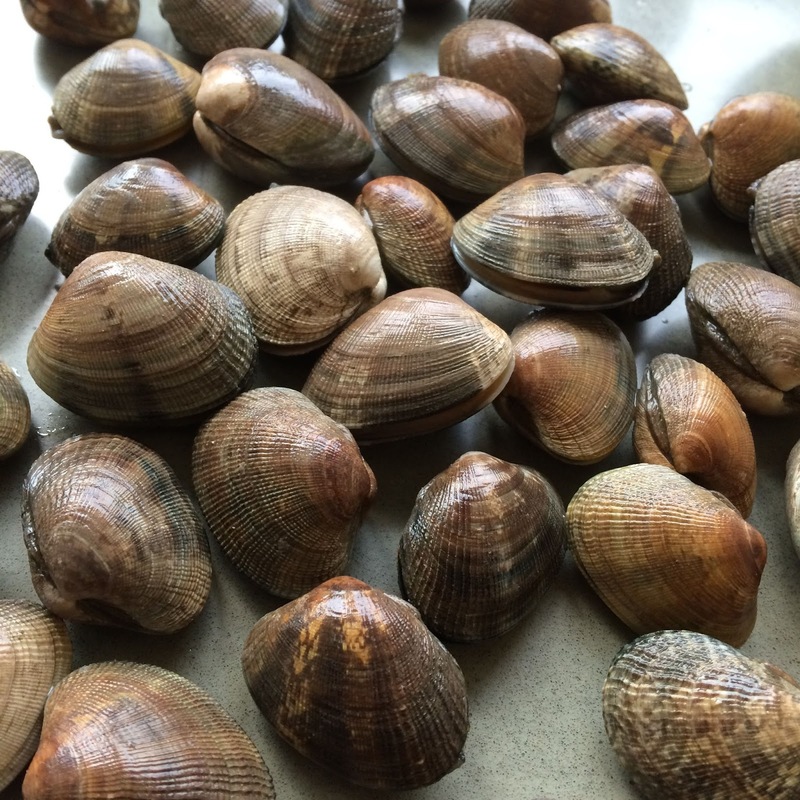 Clean the clams, discard any that will not close within a minute after tapping lightly. Boil 4 quarts of salted water in a large pot. When at a full boil, add the linguine and cook to 2 minutes short of the instructions on the box. While the pasta is cooking, prepare the clams. In skillet large enough to hold the clams, add the olive oil and heat over a medium-high flame. Add the minced garlic and parsley and cook until soft, about 1 minute. Add the clams and shake the skillet to redistribute them. Add the wine and brandy and allow them to simmer uncovered enough to burn off the alcohol, about 2-3 minutes. Cover the pan, reduce the heat to medium-low, shake the pan again. Cook for 3 minutes or until all of the clams have opened. Discard any of the clams that have not opened. 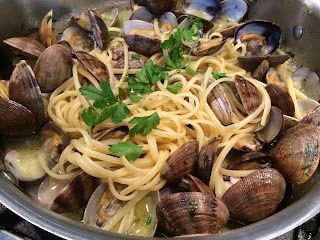 When the pasta is done, drain in a colander than add to the skillet with the clams to finish cooking for a minute or so. Serve with crusty bread, toasted or un-toasted as you prefer. The clams are delicious but the liquid is absolutely divine, be sure to dip bread to get at it.